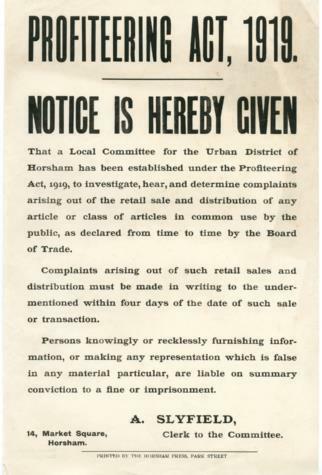 Notice is hereby given that a Local Committee for the Urban District of Horsham has been established under the Profiteering Act, 1919, to investigate, hear and determine complaints arising out of the retail sale and distribution of any article or class of articles in common use by the public as declared from time to time by the Board of Trade. Complaints arising out of such retail sales and distribution must be made in writing to the under-mentioned within four days of the date of such sale or transaction. Persons knowingly or recklessly furnishing information or making any representation which is false in any material particular, are liable on summary conviction to a fine or imprisonment. A Slyfield Clerk to the Committee. 14 Market Square, Horsham. Printed by the Horsham Press, Park Street.